On May 17, 2018, the Loudoun County (Virginia) Board of Supervisors confirmed the nomination of Edward Spannaus to serve on the Loudoun County Heritage Commission as an at-large member. 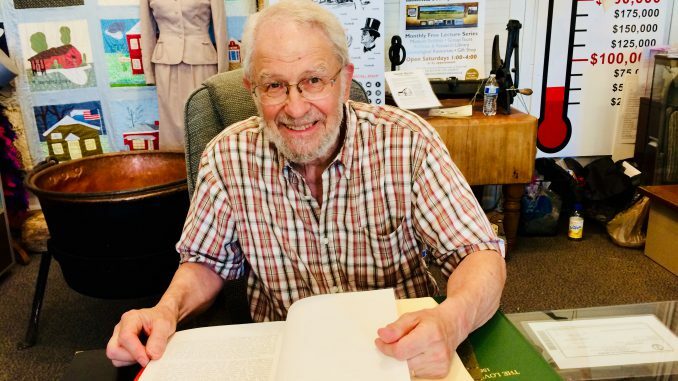 Spannaus, the vice-president of the Lovettsville Historical Society, was nominated for the Commission position by Catoctin District Supervisor Geary Higgins on May 1. According to its by-laws, “The Loudoun County Heritage Commission shall support and encourage the identification, documentation, protection, preservation, and celebration of the Heritage Resources of Loudoun County, [and] shall advise the Board of Supervisors and other County offices regarding Heritage Resources….” One of its current responsibilities is the Courthouse Grounds Research Project, to evaluate the historic significance of the Courthouse grounds and its statues – including the Confederate soldier statue – and to determine if additional monuments or interpretative markers would be appropriate to fully reflect the history of the County and all its citizens. Spannaus has been deeply involved in research, writing, and education concerning local history for many years. He was instrumental in obtaining state and federal Historic District designation for Lovettsville in 2012, and also participated in the design and placement of Lovettsville’s two Civil War Trails markers, “Union Gateway to Virginia” and “The Loudoun Rangers.” He has served on the Board of Directors of the Lovettsville Historical Society since 2007, and he coordinates its renowned monthly lecture series. He is a member of a number of historical and patriotic societies.